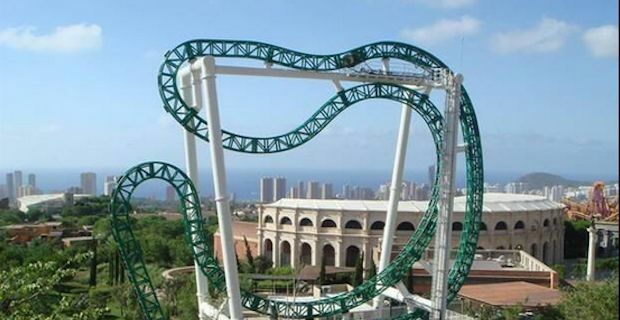 A teenager died yesterday after his harness failed while riding a rollercoaster at Terra Mitica theme park in Benidorm. The boy, who was 18 years old, was flung from the ride after his harness broke and upon landing he suffered fatal injuries to the head and body. Early reports suggested that the teenager had been British but a police spokesman in Benidorm has clarified that "He is from Iceland and not Britain as some reports have said." He had been at the theme park with members of his family when the tragic accident occurred. The boy was still alive when paramedics arrived at the park but died shortly afterwards in an ambulance. The ride in question is called Inferno(Catalan for Hell) and it includes 360 degree turns as well as pushing thrill seekers to their limits with 3g forces and speeds of over 40mph. An investigation has been launched into the events with a judicial spokesman saying "Benidorm court number two has opened an investigation following the death of a person involved in an accident at a ride in Terra Mitica theme park. The judge is awaiting a police report after which he will decide what action to take."